A free day of skiing on Bald Mountain will be given to anyone flying into the Wood River Valley on an Alaska Airlines/Horizon Air flight from Seattle this winter. Sun Valley Resort spokesman Jack Sibbach announced the deal in a Wednesday interview, and said the free day of skiing at Bald Mountain must be used the same day as the daily flight, which arrives at 11 a.m. This means half a day on the mountain after showing the plane ticket. "This is something the whole area can benefit from and push to drum up business," Sibbach said, adding that deals are being planned for other Friedman Memorial Airport flights. During the winter season, Horizon offers daily direct flights between Los Angeles and Seattle and Hailey. SkyWest—serving as a connector for Delta flights—offers multiple flights daily to and from Salt Lake City. Sun Valley Resort also offers a complimentary shuttle, taking customers from the airport to the resort. This winter is unique for the country's first destination ski resort. It will mark its 75th winter season, a fact that's being emphasized in advertisements. The resort has also switched to a new marketing firm this winter, Eleven Inc., out of San Francisco. 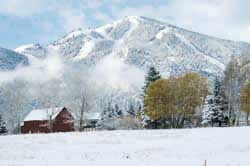 Sibbach said Eleven is still working on exactly what will be done for this winter to advertise Sun Valley. He said new ads would be coming out pretty soon. "The big push for winter starts now," he said. Sibbach acknowledged that the resort's marketing helps businesses across the Wood River Valley and vice versa. For that reason, he said the resort is willing to "collaborate" with the newly created Sun Valley Marketing Alliance in joint advertisements of Sun Valley the place, not just Sun Valley the resort. "It hasn't been discussed yet," Sibbach said, "at least not with me." The alliance consists of a four-member Sun Valley Chamber of Commerce board and a five-member marketing board. Sun Valley Resort General Manager Tim Silva is on the marketing board, which has taken over the Sun Valley Chamber of Commerce's responsibility of area advertiser and is waiting for $800,000 in funding from the cities of Ketchum and Sun Valley. "We would welcome all collaborative efforts to market the area," Sibbach said. It's too soon to tell if the 75th season has translated to increased attention. Sibbach said wintertime room bookings for the resort are normal at this point. He said the resort saw a "big push" in bookings last week, but most people don't book their rooms until their trip is two months out. "Bookings are a little later every year," Sibbach said, adding that some people call a week or even a day prior to book a room. Sibbach said he never saw such procrastination 20 years ago, but the Internet enables people to push off planning, and enables waiting for last-minute deals. But this makes winter business more difficult to gauge, as does the uncertainty of snowfall. Sibbach said he has learned to ignore winter forecasts. Instead, he focuses on what he can control: marketing.